It was ambitious, but if anyone could make it happen then The MX-5 Owners Club’s newest Motorsport Coordinator, Jon Smith could. The Blyton Bash, a weekend of MX-5 dedicated track action at the Blyton Park Driving Centre in Lincolnshire. And what a brilliant weekend it turned out to be. Project Merlot was in the hands over the weekend of Jon E, Robbie M, Martin C and long-time Merlot fan James Huggins. The weekend also saw the MX-5 Owners Club attempt to fill the entire circuit with as many MX-5s as they could to set a couple of world records. We still await final confirmation from Guinness on the records but we reckon the Merlot has always been a bit of a record breaker. There was no doubting the highlight of Jon E’s weekend, the chance to put in some very hot laps with Ma5da Racing champion Rob Boston in the passenger seat giving Jon some invaluable tips. 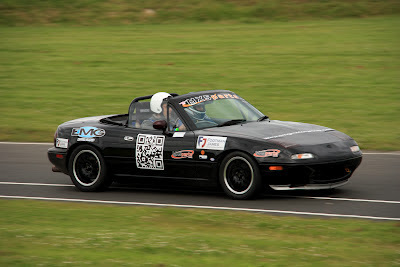 We loved the weekend and the great little Blyton Circuit, perfect for MX-5s and we are already looking forward to Blyton Bash 2013, oh yes, it’s already booked…..
Derek Higgs takes to the wheel for the WR attempt.